Brian volunteered at the Squirrely Tail Twail Wun, a trail half-marathon on February 7, so he thought it would be a good idea to sign me up to run it. I’m a fair-weather runner, so I said maybe I’d run it if I trained enough beforehand and the weather wasn’t too bad. I kind of forgot about it. Since having the cast removed from my right foot, I’d been running maybe 15 miles per week, mostly on the treadmill. Map from my GPS watch. 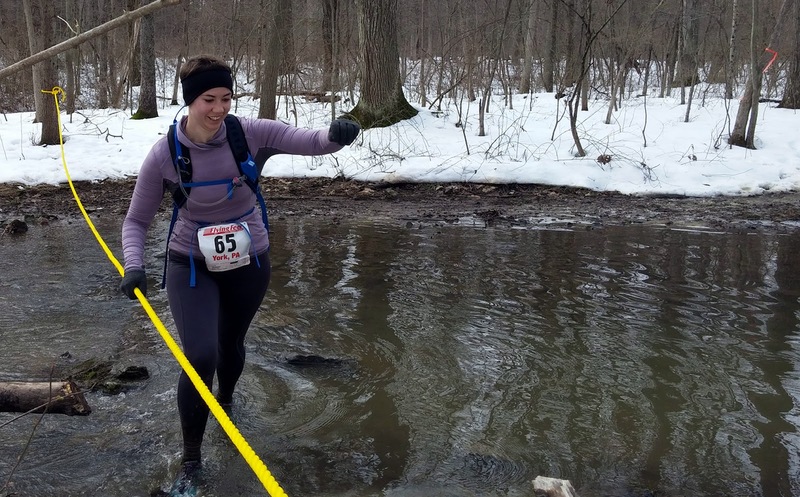 Two days before the race, race participants received an email from the race director that said the trail conditions were pretty rough, and we should all consider wearing bags over our socks and trash bags to at least our knees to prevent soaking our feet. Your feet will be numb in two miles after they get wet, he wrote. But then the race director sent another email the day before the race that said, Nevermind! The temperature was cold enough to freeze a lot of the water/snow on the trail, so bags over our feet/legs were no longer needed. Brian said he’d be volunteering about six miles into the race, and if I made it that far and didn’t want to keep running, he’d drive me back to my car. 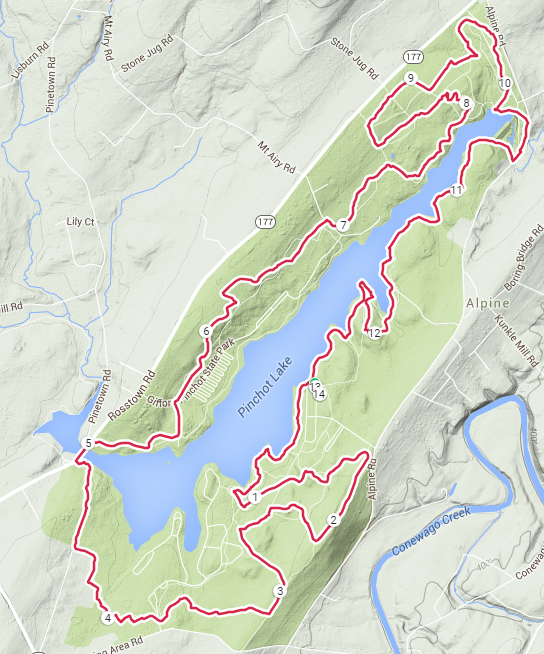 That sounded good to me – I knew I could handle six miles. The morning of the race was in the low 30s with a projected temperature in the high 40s for the afternoon – not terrible running weather for February. Brian was on site helping with set-up, and he texted me to ask if I had spikes for running on ice. No, I said. Will I need them? No, but maybe bring some gloves to protect your hands if you fall, he said. Despite that, I packed my bags and drove to Pinchot Park. I was halfway there when I realized I forgot to pack my trail running shoes, so I turned around. By the time I did get to the registration table, it was five minutes to start time. In those five minutes, I watched two people slip and fall on the ice. Brian walked me to the starting line and said he might be more like 7 or 8 miles into the race, but he’d still drive me back to my car if I wanted to bail by then. I felt pretty negative before the race. First of all, I was cold. Second, I had just come out of a foot cast in the fall, and I was in no hurry to injure myself again. I had to tell myself it would just be a fast hike. The race started, and I jogged alongside close to 200 other runners. The first mile was my slowest because it was literally a sheet of ice. I watched at least three people fall in that first mile, and one woman – maybe not even a quarter mile into the race – was on the ground in agony after slipping. So I tiptoed across the icy parts as I watched all of the people prepared with spikes stomp or slide their way through it. But after that first mile, the ice only came intermittently and it was usually avoidable. The snow was hard and filled with footprint divots, and my ankles were pretty sore within the first 5K. But I warmed up quickly while running, and I had a hydration pack and a few GUs, so I stayed well-hydrated and energized. Other than sore ankles and sore hips, I actually felt pretty good. I ran when I could, I jogged or fast hiked when I couldn’t because of the terrain. I saw at least a half-dozen more people wipe out on the course. The trail through the woods was beautiful – or at least what I could see of it when my eyes weren’t glued to the icy divots in front of my feet. I passed a lot of people who had passed me as I tiptoed across the ice at the beginning of the race. My legs felt strong running uphill. After mile 6, I started looking for Brian. After mile 8, I gave up looking and wondered if he had tricked me and maybe he wasn’t stationed on the trail at all but had stayed at the registration area. And I thought, oh well. Even if I had to walk for a few miles, I could still make it. My feet and legs had gotten soaked in snow and cold mud up to my knees, but my feet weren’t numb. I could make it. Just as I approached mile 10, I saw him, sitting on the far side of a stream, one that I had to cross, and the only way to cross it was by wading through it, which I did. 10 miles in and still smiling! Photo courtesy of Brian. Brian helped me to get a GU out of my bag. I ate it and told him at this point, I was just going to keep going. I heard people behind me approach the stream, and my competitive instinct kicked in – I didn’t want anyone to catch up to me. Brian gave me a good luck kiss and then I kept running. By then, the temperature was warmer so the snow was slushy and I could almost skate through it, which was kind of fun, especially going downhill. That song “Everyday I’m Shuffling” was stuck in my head as I shuffled down the trails. When I ran past a part of the disc golf course, I knew the finish line was around the corner. And then there it was. Three hours and five minutes after I started. I was dazed and tired and sore, but smiling and amazed I actually finished the whole thing. It took a week to recover, and I can finally walk up and down stairs again without crying. The best part of running my first half-marathon on an icy snow trail is that it’s almost guaranteed that I’ll PR when I run my next half!